The first Dublin Quiz Open (indeed the first event of its kind in Ireland) took place on Saturday last in Glasnevin. I’m delighted to say that the day exceeded all expectations – both for myself and, I dare say, the organisers. In total 38 quizzers turned up to The Addison Lodge, the day’s venue and there they got to take part in three different quizzes, spread over six hours. The organisers had done a terrific job of covering all the bases: the stage featured a projector and amplifier, there were trophies to be won and there were several tins of assorted biscuits (aka ‘brain food’) being passed around. It was all pretty sweet! First up was the International Hot-100, the entry period for this month being open until tonight, if anyone who didn’t make it on Saturday still wants to take part. Anyway, for reasons outlined in the previous sentence, I won’t make any comment on the questions asked etc. Until tomorrow comes, it simply wouldn’t be fair. The team quiz was the second event of the day. If numbers had been low, the plan was to run this as a pairs event. Thankfully, there was no need for that. What was needed though was a random draw to allocate teams for the many people who came without one (myself being one of these people). The draw put me in a three-man team, with two Dublin quizzers, Michael Connolly and Gary Stephens. Stuck for a team name (what’s new? ), we plumped for the two items which had been left on our table in the interval following the Hot-100: Bic Biros and Biscuits. Throughout the opening rounds we were a model of consistency, never scoring less than 7, never scoring more than 8. When the quiz paused after round #3 for lunch, we were in third place, 3 points off the lead. After the break it was more of the same (scoring-wise) but our reliable scoring rate started to tell on our competitors and, by the end of round six, we were tied for the lead. This was an eight-round quiz (7 x 12, 1 x 16) and being in joint-first with just two rounds left was exciting. Thankfully (for us), luck smiled on the Bic Biros and Biscuits boys and we finally were able to break the 8 point barrier in both of the final rounds (9 and 11*). This surge of point scoring was the equivalent of a successful lunge for the line in a foot race and, unbelievably, we emerged as winners by six points. Our final score was 65/100. Bic Biros and Biscuits: Michael Connolly, John Nolan and Gary Stephens. After that, events moved quickly (for time was tight with several people needing to catch trains home etc) to the individual quiz event itself. This event featured a selection of questions which wouldn’t have seemed out of place at the European Quiz Championships – with final scores to match. At the half-way mark in this quiz, John Hayes from Ennis was a-top the leaderboard, just ahead of Lorcan Duff (who had top-scored in the Hot-100 earlier), Padraic Fanning and Kevin Jones, who was sitting at my table. I was nowhere to be seen (well, 10th) after having a bit of a mare over the opening four rounds (including two 4s and a 3). Unfortunately John was one of the afore-mentioned quizzers who needed to catch a train and I’m sure this had an effect on him. Indeed, even though we were entitled to 10 minutes for the final round (again featuring 16 questions), he handed up his answer sheet and damn-near ran out the door after only about four had elapsed. When the final scores were announced John had dropped from first to third. 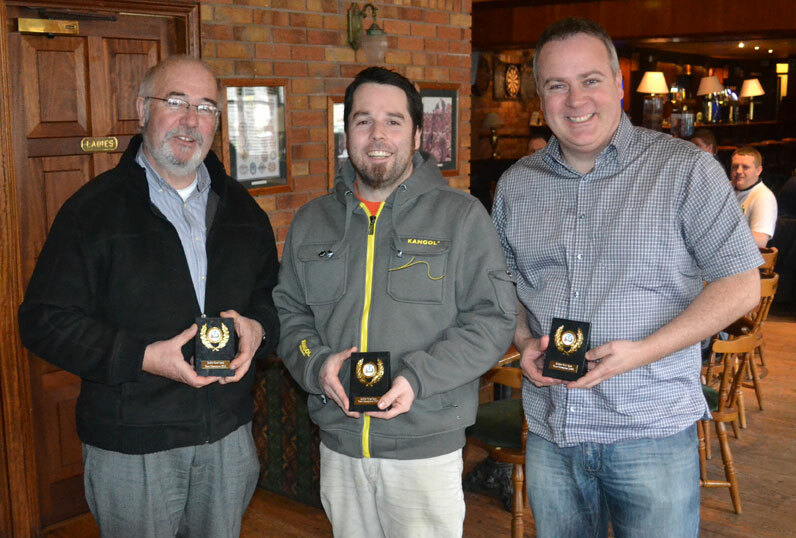 Lorcan had managed to pip Padraic to the title, his 51 being just one ahead when the final round ended. Congratulations Lorcan – yet another title for the mantlepiece! For my part, I had (just like in the team quiz) scored quite highly in the final two rounds (9 and 8) and ended up in fourth, just one point ahead of Kevin and my team quiz colleague Gary Stephens. You can check out the final scores from the three events, and a gallery of other photos, on the Irish Quiz Organisation’s Facebook page. The quizzing ended at about 5.35, just a little over schedule. A final duty for those of us who remained was to pose for a group photo, outside. 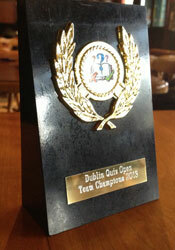 Some of the competitors who took part in the inaugural Dublin Quiz Open. Once again I’d like to congratulate the organising committee of Derek Cray, Colm O’Sullivan, John Groarke (a very able and affable quiz master) and John O’Sullivan. John G’s wife Michelle was a very important member of the team on the day also, as our scorekeeper. Thanks to all who came along and took part. Hopefully we’ll see you again at the next event which will take place in Athlone on the first Saturday of June. Until then! * Out of 16, admittedly. I had previously included the questions from the individual quiz here on this post for download but have now removed them at the request of the British Quiz Association, who created them.